Like Snapchat, Instagram is now curating videos around events and trending topics. 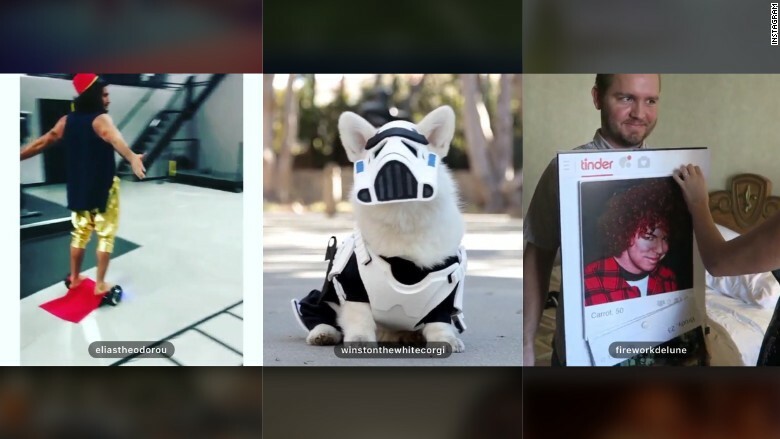 The Facebook (FB)-owned social network added a new feature this weekend that aggregated some of the most creative video posts from Halloween. On Saturday and Sunday, Instagram users in the U.S. were met with an option to "Watch Halloween's Best Videos." The feature launches a full-screen page, and users can swipe up or down to move through the string of videos or let them play through automatically. Watching all of the roughly 100 posts takes about 20 to 25 minutes. Each clip is less than 15 seconds, per the app's time limit for videos. Users can also watch the video feed through the Explore tab. Snapchat has generated features about news and events for the past year with "Live Stories." Twitter (TWTR) recently launched a similar feature called "Moments." Instagram did not immediately respond to requests for comment. Making sure the big kids don't steal all the candy! FSU Marching Chiefs do it again...this time - THRILLER 👻🎃 Full video to come soon! #FSUMarchingChiefs #THRILLER #MCATDT #MichaelJackson #Zombies #DancinChiefs #StandingOvation Link to the full video 👉🏽in our bio! 8. Tinder app costume -- It's a match!